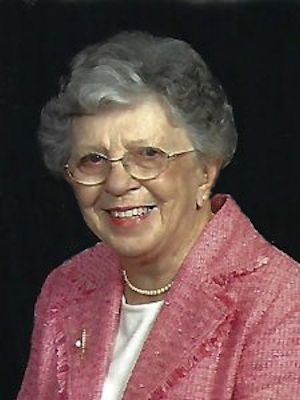 Obituary – Hoch, Frances (Treeman) « Perry High School Alumni Association, Inc.
Frances Treeman Hoch joined the Church Triumphant on March 18, 2018 at the age of 93. Memorial service: 11a.m. Monday, May 7, 2018, at Westminster Presbyterian Church with interment at Resurrection Cemetery in Oklahoma City. Memorial gifts may be given to Westminster Presbyterian Church in Oklahoma City. Frances was born in 1924 to Ralph William and Frances Irene McCune Treeman in Perry, Oklahoma. She grew up in Perry with a sister, Elizabeth, and two brothers, Bill and John. She was baptized in the Presbyterian Church, attended public schools in Perry, and played basketball and the trombone in the band. “Francie” attended Park College in Kansas City, Missouri for 2 years and graduated from the University of Oklahoma with a degree in botany. Her love of trees, flowers and reciting their genus in Latin persisted throughout her life. She worked in the State of Oklahoma Seed Lab hybridizing iris, a flower she cultivated and loved. It was at OU that Frances was introduced to her future husband and love of her life, Francis Joseph “Bud” Hoch, by his sister, Betty Jane Hoch Jones. They married in 1949. After a brief stint in Houston, they returned to Oklahoma and settled in Oklahoma City. They were early members of Westminster Presbyterian Church. Twins, Ann and Jane, came first, and son, Joe, was born 5 years later. Frances and Bud lived active lives traveling, playing golf, participating in their Park Estates Supper Club, and their church. Family was a priority to Francie: she chauffeured children to various activities, supported Bud’s career, cared for her mother; her brother, John; her sister, Elizabeth; and was devoted to members of the Hoch family, especially those in Oklahoma City: Joanne and Tom Hoch and family, Helen and Al Hoch and family, and Bud’s parents. Francie was an elder, clerk of session and sang for over 30 years in the choir at Westminster Presbyterian Church. She and Bud enjoyed their 40 plus years living in the home they built on Lake Hefner Golf Course where they had wonderful neighbors, and Francie enjoyed the nightly neighborhood happy hour group after Bud’s death. Frances was preceded in death by her parents and her three siblings, her husband of 62 years, and a nephew, Jeff Treeman, and niece, Christine Jones Goodwin. She is survived by daughters, Ann Hoch of Fredericksburg, TX, and Jane (and Dan) Sykes of Fort Worth, TX; son, Joe (and Roxanna) Hoch of Livingston, MT; and mother of granddaughter, Alison, Mary Jo Hoch; she has five grandchildren, Clark (and Lauren) Sykes and Elizabeth (and Brian) Johnston of Fort Worth, Alison (and Todd) Ayrea of Richardson, TX, Leanna (and Kyle) Krenik of Bozeman, MT, and Joanne Hoch of Livingston, MT; her four great grandchildren include Lucy and Polly Johnston and Whit and Eva Sykes. She also has numerous nieces and nephews who adored her and her special sister-in-law, Joanne Hoch.